Think supergroups are the exclusive domain of hard-rocking dudes? Witness Wild Flag, a new indie rock assemblage that brings together members of Sleater-Kinney, Helium and The Minders. For Sleater-Kinney fans, especially, this is welcome news, as seminal Portland, Oregon-based band has been on hiatus since 2006. 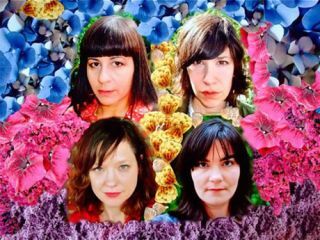 Wild Flag will feature SK singer/guitarist Carrie Brownstein and drummer Janet Weiss alongside Helium's Mary Timony and Rebecca Cole from The Minders. The band has reportedly signed to Merge Records and is currently recording its first album, with plans for a 2011 release. They've also booked a string of dates on the West Coast (see below), so if you happen to be out and about in that neck of the woods in November, you're in luck. While we wait for new music from Wild Flag, let's take a look and listen to one of the last (for now, anyway) offerings from Sleater-Kinney, Modern Girl, off their 2005 album The Woods.